All New Music Video from YBC – Those Were The Nights! 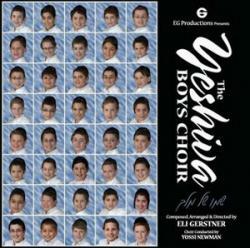 New Yeshiva Boys Choir CD Cover! I’m betting if you asked my kids, they wouldn’t remember a time when Miami Boys Choir was the only game in town. My younger kids, at least, have grown up listening to Yeshiva Boys Choir and can’t possibly imagine life without YBC. So many boys choirs, so many different styles…so much music to listen to!! Let’s talk about the cover for a minute. When the cover art was released, a lot of jokes were made about it looking like the Brady Bunch. (For those of you who don’t know what the Brady Bunch is, look it up on Wikipedia). Me? I like the cover. It’s the kids, plain and simple. And isn’t that what we listen to a boys choir for? Which brings me to another point. Feel free to disagree. This album is clearly a showcase for Yaakov Mordechai Gerstner. While I have nothing against Gerstner Jr., I would have loved to have heard more of the other boys in the choir. Clearly there are some very talented boys here. My thoughts on the album itself? It’s pretty much what we’ve come to expect from YBC. A mix of pop, slow songs and a few that lean more towards rock. Personally I would like to hear less of the really high notes. A little more music in the background and less schtick. Songs that are more singable for the average person. Sh’moy – I love this song. It is YBC at its best. Fun, catchy, upbeat, with great harmonies. The lyrics are fresh and fit so well with the music. Everything about this song just works. Not too noisy, no crazy high notes. No question, this is the best song on the album, hands down. Hamalach – My first thought was that these lyrics have been done to death and I would have chosen something different. But the music works so well with the mood of the lyrics and this slow song is really quite good. Simple, pretty and not overdone, just the way it should be, though the ending is a little longer than it should have been. I would have ended the song at 5:52 and lost the last three bits of ending that continue for another 45 seconds. Atoh Kidashtoh – I’m a little conflicted on this leibidic song. It is growing on me, but it just seems like there is too much going on in this song. If a song is good, it will shine on its own – no need for so much embellishing. Will I love it in two weeks or will it be an okay song with some nice harmonies? I don’t know. But I didn’t want to wait two weeks to publish this review! Oz V’Hadar – This pretty, slow song by Yossi Newman is one several songs on this album with gorgeous arrangements by Yisroel Lamm. Beautiful harmonies on the first part. I would have preferred if the second part didn’t go quite so high at the end. Why is it that composers forget that we want to be able to sing along? Baruch Hashem – This Yossi Newman rock song wannabe just wasn’t my speed. Sorry. Derech Sheker – Another Yossi Newman composition. I really like the first part, which is not surprising given that it is eerily reminiscent of Al Hakol, my favorite song from YBC 3. Extra points for using lyrics that have probably never been used in Jewish music before. I’m not sure that the third part added anything to this song. Torah Tzivah – I’m not quite sure what this song is trying to be. Style wise, it’s all over the place. Min HaMeitzar – Another slow song, nicely arranged by Yisroel Lamm. The more I listen to this hartzig song, the more I like it. Simple, sweet, beautiful. No schtick, no screaming, just let the beauty of the song carry it. While normally having an adult singing with the kids takes away from the song, in this case, I thought Gerstner dueting with the kids added to it. Simcha – This fast song, a joint effort by Eli Gerstner and Yossi Newman, is cheerful and upbeat. Not quite sure the giggling in the middle added anything to the song. Honestly, I would have ended the song at 3:09. It just gets too busy after that. Sometimes less is more. Kah Ribon – This beautiful slow song with great arrangements by Yisroel Lamm is one of my favorites. Why did they bury such a good song at the end of the album? This is exactly what a slow song on a boys choir album should be: terrific voices, gorgeous song, great harmonies. Loooove the harmony at 1:54. Absolutely stunning. I think the CD is amazing!! The soloists are excellent, there is not one song that I don’t like. Usually I agree with everything you say, Kol Isha. This is the first time I find myself disagreeing at all. I haven’t really sat and listened to the slow songs, but the fast songs really impressed me on this CD. Baruch Hashem was done very well. I liked it a lot, even though it was very “rock song wannabe”. I see what you mean about Torah Tziva’s style being all over the place, but it doesn’t sound strange. As much as it has a bunch of styles in it, they were put together nicely. It reminds me a little of Malochim from YBC 1. Simcha is amazing!! The intro reminds me of some other song, but I can’t place it. The giggling made me start laughing out loud and the end of the song was great. I didn’t find it extra at all. Not a problem!! Glad you enjoyed them…that’s the great thing about music – it’s subjective. There is no right or wrong. I don’t agree with you 100%, I actually liked the album a little more than you do, but I must commend you for writing what seems to be a very honest and up-front review “This is what I like, this is what I don’t like” without a lot of fancy words! And kudos to JMR for posting it! It is only through honest feedback and reviews that JM will continue to improve! Joel: I like the album! Not every song was one I would put on my mp3 player, but all in all it was an enjoyable CD! Since you decided to single out the giggling at 3:09 in Simcha, I have to respond. I am impressed that YBC feels free to explore doing different and interesting things. I love love love the giggle and I challenge anyone not to smile when hearing it. Isn’t that the point? Kudos to whoever thought to include it, and keep up the innovative work! i absolutely love this album and every album of ybc! i disagree 100% that this was for ym gerstner. a lot is tani martin and the kogans sound a lot like gerstner some times which make it sound as if ymg has the tape for himsels. anyways, as a sidepoint i think ymg is amazing! i also love the giggling which i heard was not done specifically for this. ymg was laughing once and eli recorded it on his phone and after decided to put it in. i laugh every time i hear it!